I was ridiculously excited when I first heard the news this summer that Arthur was finally going to put out another album. Their first EP, Loneliness Is Bliss, was released way back in 1999, so I awaited their new full length, Watch The Years Crawl By, with baited breath. You’ll forgive Arthur frontman Mike Herrera for the 11 years between releases. You see, he’s been a little busy with steadily making killer punk rock albums and touring the world with MxPx, he has a new alt-country/punk/rockabilly band Tumbledown and he also started up Monkey Trench Studios and Legionnaire Army clothing as well. The wait was well worth it though because Watch The Years Crawl By is a nice slice of melodic alt-rock that sounds great, is produced well and is substantially different from what’s going on in MxPx and Tumbledown. Mike sings lead and plays guitar in Arthur and he’s joined by fellow MxPx bandmates Tom Wisniewski on guitar and Yuri Riley on drums, as well as Neil Hundt on bass. All four guys combine to create a powerful, yet saccharine sweet, rock record that deals with falling in love, maintaining relationships and acknowledging the incredible sway girls have over smitten guys. While there are enough connections to draw in fans of Mike’s other bands, Arthur is a definitely a distinct and individual band standing on their own sonic legs. Watch The Years Crawl By opens with “Cold Outside,” an upbeat singalong number dialed in just a few clicks shy of pop-punk. The song is super catchy and you’ll find yourself matching the “Called every number I had programmed on my phone” chorus before the song’s even through. Other tracks like “America,” “Thought A Lot” and “Be Still My Heart” follow the same intentional groove that’s balanced somewhere between reckless and reserved and all of them showcases a hooky chorus as well. This comfortableness with deliberate tempos and poppier melodies show a different side of Mike’s creativity and allows the unique tone of his voice to really have some open places to shine. In fact, the range of music and mood on Watch The Years Crawl By creates an interesting and diverse listening experience. Songs like “Tuck You In” and “Out Of The Blue” have a vintage R&B-based rock vibe and sound like they could’ve been played at the “Enchantment Under The Sea” dance from Back To The Future. “Tie Me To You” scores major points with me by feeling like a cool, early R.E.M. outtake. The minor key waltz of “Fortissimo” has a really nice atmosphere and the guys build the song to an impressive crescendo. Even when they pull out an acoustic for “To Have And To Hold,” they maintain the pulsing flow of the album without missing a step. Watch The Years Crawl By is probably one of the most divergent projects Mike has been a part of, but it’s overall character and rhythm feel cohesive and familiar. This album is truly remarkable and the results have rewarded the wait. I sincerely hope there will be more Arthur albums in the future, even if we have to wait another 11 years. 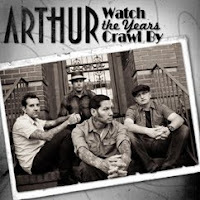 For our second holiday giveaway, we’ve got a free cd of Watch The Years Crawl By from Arthur. Just like with our other giveaway, I’m going to ask a simple trivia question and all you have to do is email your answer, along with your name and address, to mysocalledsoundtrack@gmail.com. I’ll pick a random winner from the correct answers. The giveaway is limited to the United States and the deadline is Saturday, December 18th. Arthur Trivia: What is the significance of the name Arthur? I know it’s a softball but it’s Christmas and I’m feeling generous. Believe me, this cd is so good you’d be crazy not to enter! It’s worth every penny so getting it for free seems almost criminal. Get those answers in and your stocking may end up a little fuller this Christmas.